Because of my health issue, i am not including tomatoes in regular cooking or add 1/2 or few pieces for some most needed recipes. No tomato based curries or rice for the past 5 months. 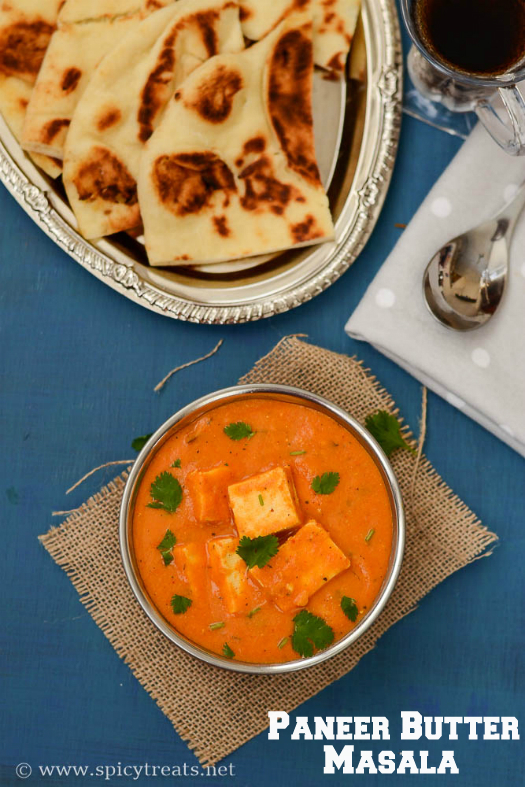 This Weekend, kids asked for Naan & Paneer gravy for lunch. I also wanted to cook something for blog and first decided to make my neighbor aunt's Shahi Paneer. When I started the recipe preparation I got confused with the recipe, since she told 3 curry recipes together while we went for a walk and I also forgot to note it down. First thought of calling her for the recipe then remember its weekend and they may be busy or went out and decided to get the recipe later. 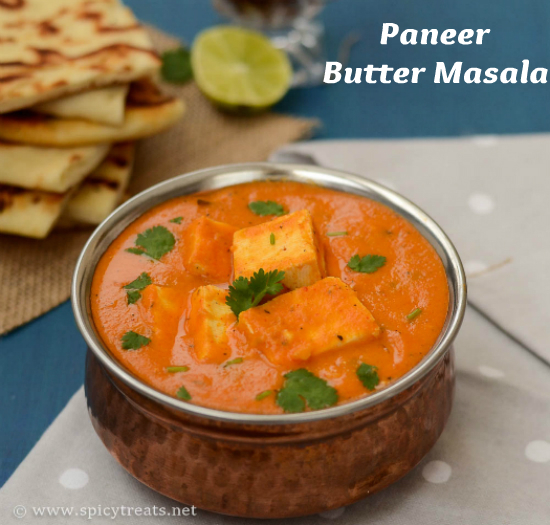 After a while decided to cook my kids' recent favorite paneer curry, Nawabi Paneer or other Paneer curry recipe and checked my blog for Nawabi Paneer recipe and then noticed that I haven't posted Paneer Butter Masala here. I don't know how I missed to share this recipe here, I have made this so many times, for kids' birthday parties, get togethers and so many occasions. I thought, I have shared this recipe during my initial days of blogging and never thought to take even pictures to update my old post. Then decided to make my version of PB Masala and it was Paneer Butter Masala and Naan for weekend lunch, kids happily had their favorite meal for lunch. Now off to the recipe..
First soak cashew nuts in hot water for minimum 10 minutes and then grind to a fine smooth paste. 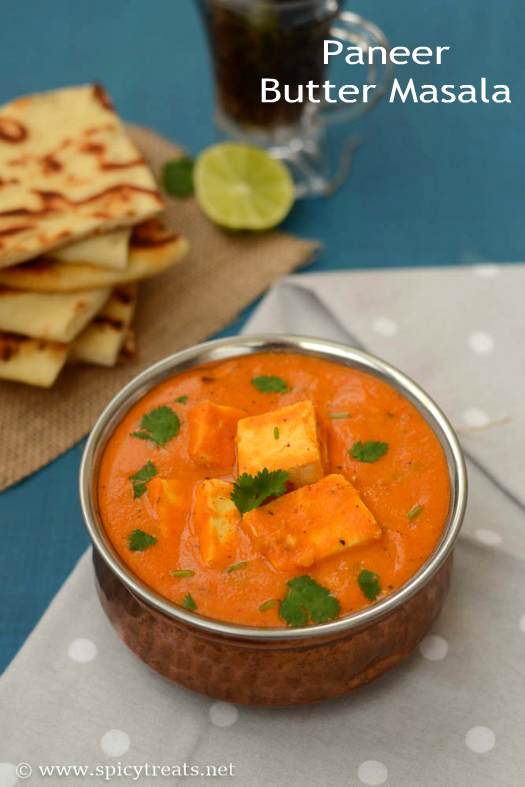 Soak the paneer cubes in warm water until use. Then heat 1/2 tsp oil in a pan, when it is hot add roughly chopped onion and saute for 2 minutes. After that roughly chopped tomato and saute until it is soft and not mushy. And then allow the onion-tomato to cool for a while and then blend it to a smooth puree, if desired filter the puree using a mesh strainer and keep ready. Now, heat butter and oil in a pan, when it is hot add bay leaf and star anise and fry well. Then add ginger garlic paste and saute in medium heat until raw smell leaves. After that add the onion-tomato puree, pinch of salt and sugar cook in medium heat until oil shows on top. Then add red chilli powder, cumin powder and cook for 2 minutes. And add ground cashew paste stir well and add enough water(1 cup), enough salt and allow the gravy to boil. 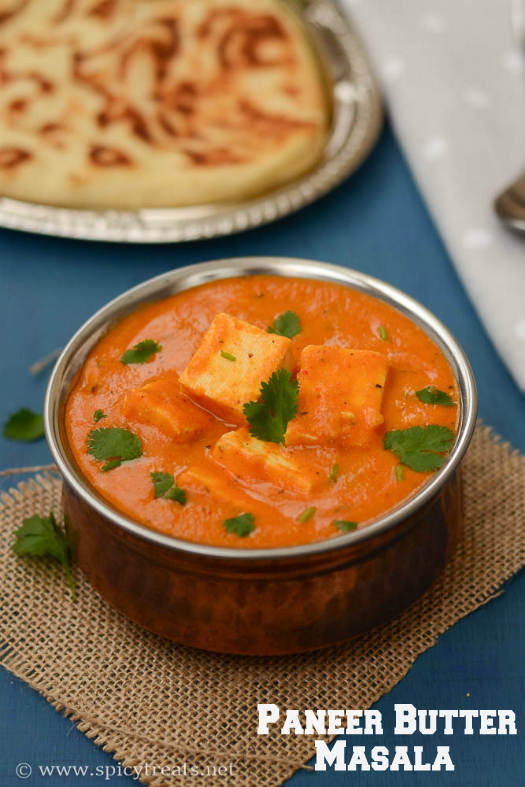 When it starts boiling add the paneer cubes and cook for another 2 minutes. Now add kasoori methi, 1 tsp butter, garam masala and mix everything well and again simmer for 2 minutes. Lastly add milk or cream and stir gently and simmer for few seconds and switch off the stove. 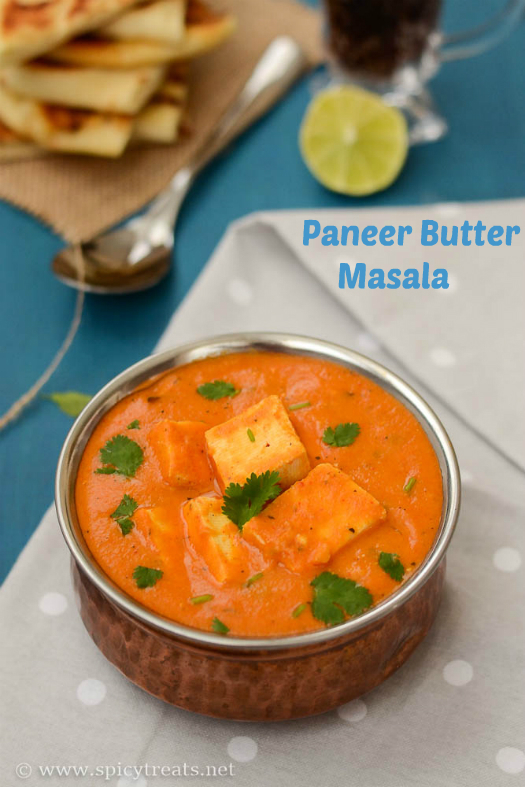 Garnish with cilantro and cream(if desired) that's it..Paneer Butter Masala ready. Serve with Naan/Phulka/Plain paratha or Jeera Rice. I read this tip on a magazine that Sauteing tomatoes before grinding gives nice color to the puree/gravy. I used med ripe tomatoes and kashmiri chilli powder and that itself gives nice orange color to the gravy and didn't used artificial color. If you ripe plum or roma tomatoes, then you will get eve more deep orange-reddish color. Filtering onion-tomato puree is optional but it helps to get rid of seed and skin and also gives you nice smooth gravy. I used milk, you can also use cream in the end and also for garnishing.